Background: Drug Metabolism and Pharmacokinetic (DMPK) studies of Taxus natural products, their semi-synthetic derivatives and analogs are indispensable in the optimization of lead compounds and clinical therapy. These studies can lead to development of new drug entities with improved Absorption, Distribution, Metabolism, Excretion and Toxicity (ADME/T) profiles. To date, there have been no comprehensive reviews of the DMPK features of Taxus derived medicinal compounds. Natural and semi-synthetic taxanes may cause and could be affected by Drug-drug Interaction (DDI). Hence ADME/T studies of various taxane-containing formulations are important; to date these studies indicate that the role of cytochrome p450s and drug transporters is more prominent than phase II drug metabolizing enzymes. Mechanisms of taxane DMPK mediated by nuclear receptors, microRNAs, and single nucleotide polymorphisms are being revealed. Method: Herein we review the latest knowledge on these topics, as well as the gaps in knowledge of the DMPK issues of Taxus compounds. Results and Conclusion: DDIs significantly impact the PK/pharmacodynamics performance of taxanes and coadministered chemicals, which may inspire researchers to develop novel formula. 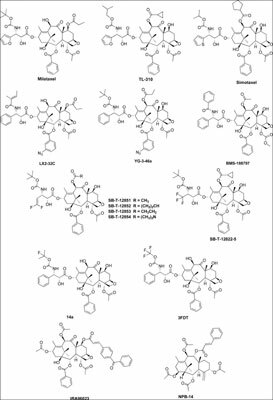 While the ADME/T profiles of some taxanes are well defined, DMPK studies should be extended to more Taxus compounds, species, and Taxus - involved formulations, which would be streamlined by versatile omics platforms and computational analyses. Further biopharmaceutical investigations will be beneficial to the translation of bench findings to the clinical applications. Keywords: Taxus, taxane, drug metabolism, pharmacokinetics, structure ADME relationship, drug development. Keywords:Taxus, taxane, drug metabolism, pharmacokinetics, structure ADME relationship, drug development. Abstract:Background: Drug Metabolism and Pharmacokinetic (DMPK) studies of Taxus natural products, their semi-synthetic derivatives and analogs are indispensable in the optimization of lead compounds and clinical therapy. These studies can lead to development of new drug entities with improved Absorption, Distribution, Metabolism, Excretion and Toxicity (ADME/T) profiles. To date, there have been no comprehensive reviews of the DMPK features of Taxus derived medicinal compounds. Natural and semi-synthetic taxanes may cause and could be affected by Drug-drug Interaction (DDI). Hence ADME/T studies of various taxane-containing formulations are important; to date these studies indicate that the role of cytochrome p450s and drug transporters is more prominent than phase II drug metabolizing enzymes. Mechanisms of taxane DMPK mediated by nuclear receptors, microRNAs, and single nucleotide polymorphisms are being revealed.